Permanently shadowed craters on the moon or Mercury are one of the most exciting locations to search for water. Because the walls of these craters protect certain spots inside from the rays of the sun, it’s quite possible for ice to lurk inside of there. We’ve found ice on so-called airless worlds because of this trick of geometry. So how about exploring them? What’s the best way to do so? The NASA Innovative Advanced Concepts office suggests using TransFormers to get inside these places. No, not the awesome robots you see in the movies, but still something that has a certain degree of complication: “multifunctional platforms that can change their shape and function”, according to the agency. Like the iconic science fiction heroes, however, the TransFormers would be able to unfold and change their shape. These machines could relay information between a rover and an orbiting satellite, or reflect solar energy on to a target (say, a solar-powered rover). The challenge with putting a rover in a permanently shadowed crater is figuring out how to power it. Nuclear power sources have special handling considerations during preparation and launch that must be taken into account for safety reasons. Solar power, however, would not be possible in these craters given there is no sunlight. Putting a TransFormer at the crater’s edge, however, could make the environment a friendly one for a rover powered by the sun. It could reflect light inside and provide a power source for the rover to keep moving. Solar-panelled rovers are already used on Mars. 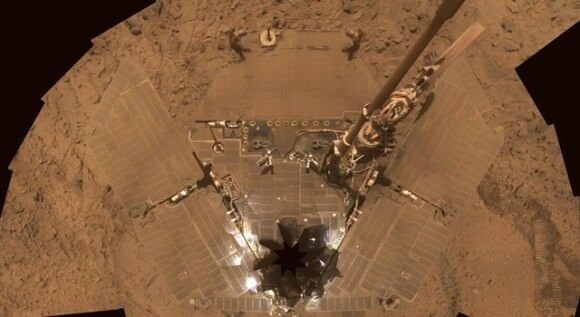 Here, the Spirit rover’s solar panels were covered with dust until a gust of wind blew it off in 2006. Credit: NASA. And once that rover starts running around, it would have immense scientific benefits, NASA stated. “For example, water found in the permanently shadowed areas of craters on the Moon or Mercury can reveal clues about planetary formation and history, and could be used as a resource for astronauts,” the agency wrote. This could even be extended to the Red Planet, which offers the enticing possibility of stumbling across life.